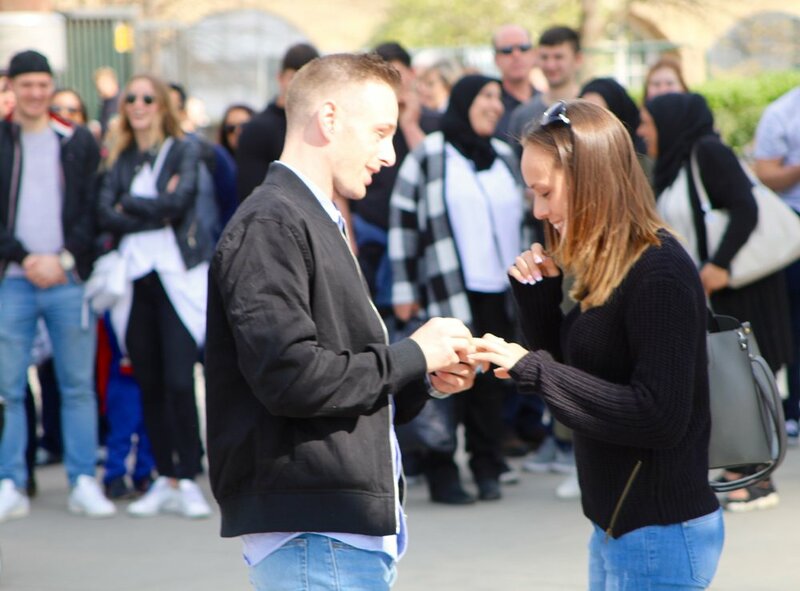 Leigh and Adam contacted us back in January - they wanted to do something special to propose, and being best friends, they wanted to do it together! Ella and Kirsty, their girlfriends, were also best friends, so the ruse was simple - take the girls out for lunch, and for a walk along the Southbank afterwards. They asked 'a stranger' (well, that would be me!) to take their photograph - in return, I asked a small favour - would they mind being in the audience for our dance video? We were about to film.... 'If you guys stay and watch, it'll encourage everyone else to stop! It's only 5 minutes! '...They of course agreed! Leigh and Ella met on Tinder, and as a result, have a joke together about the song 'Timber'! And Adam and Kirsty's favourite song was the classic 'All of Me' by John Legend. Getting those two to mesh well was a task! But we did it, and it allowed for some variety in our choreography that drew in a huge crowd. But we saved the best till last...Leigh had convinced Adam that they had to join in, and with much encouragement and a video tutorial from me, the boys launched themselves in between the dancers and danced their socks off...the girl's faces were a picture! Up until this point they'd had no idea it was all for them! And when they went to get the girls - and the crowd realised what was going on - the cheering was deafening. It was really something very special... of course (spoilers) they said yes! Leigh and Adam had been worried that the girls wouldn't want to share their moment - so we even provided two videographers and two separate edits for the girls so that every second of their own proposal was captured. But for you guys, here is the joint edit in it's full glory! Enjoy...and take this as an example, Tinder actually works! 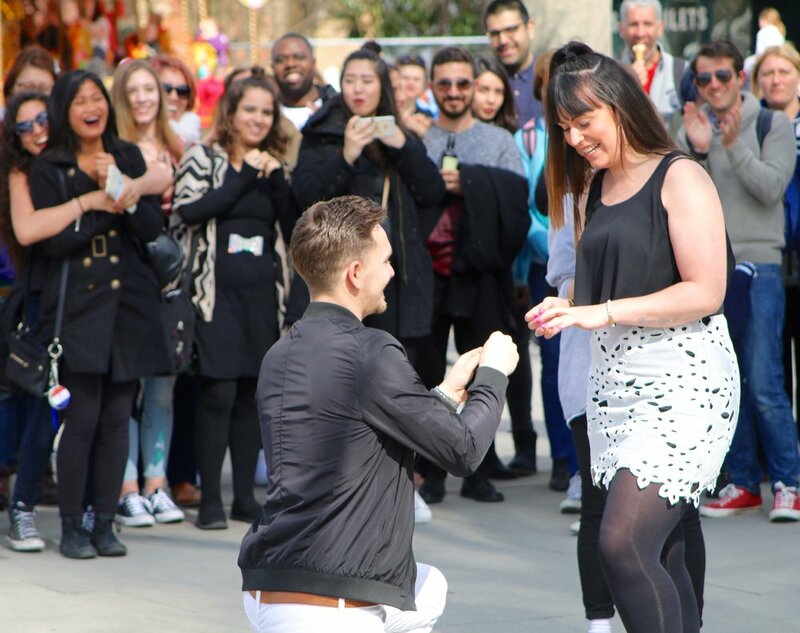 April's Flash Mobs - Love Was In The Air!